VERSAFINE CLAIR Es gibt 22 Artikel. VERSAFINE CLAIR NOCTURNE, SCHWARZ. 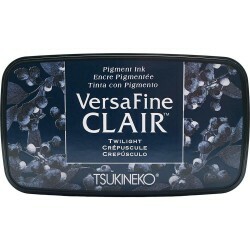 wird von LAVINIA STAMPS empfohlen The VersaFine Clair pigment ink pad brings out the finest details. Once dry, stamped images are waterproof and will not smear. Images are light fast and fade resistant. Perfect for using with watercolors to color stamped images. The white edge of the ink pack is normal. 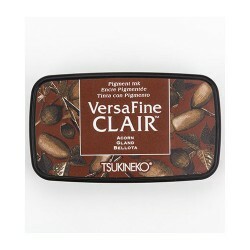 VERSAFINE CLAIR acorn The VersaFine Clair pigment ink pad brings out the finest details. Once dry, stamped images are waterproof and will not smear. Images are light fast and fade resistant. Perfect for using with watercolors to color stamped images. The white edge of the ink pack is normal. 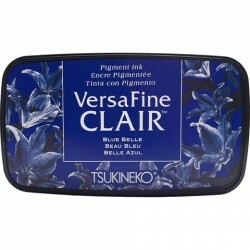 VERSAFINE CLAIR BLUE BELLE The VersaFine Clair pigment ink pad brings out the finest details. Once dry, stamped images are waterproof and will not smear. Images are light fast and fade resistant. Perfect for using with watercolors to color stamped images. The white edge of the ink pack is normal. 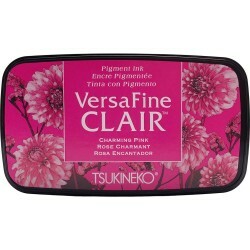 VERSAFINE CLAIR CHARMING PINK The VersaFine Clair pigment ink pad brings out the finest details. Once dry, stamped images are waterproof and will not smear. Images are light fast and fade resistant. Perfect for using with watercolors to color stamped images. The white edge of the ink pack is normal. 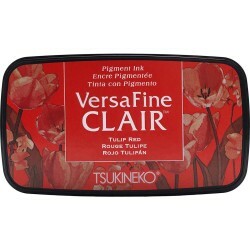 VERSAFINE CLAIR TULIP RED The VersaFine Clair pigment ink pad brings out the finest details. Once dry, stamped images are waterproof and will not smear. Images are light fast and fade resistant. Perfect for using with watercolors to color stamped images. The white edge of the ink pack is normal. 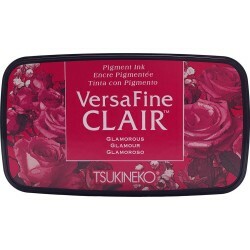 VERSAFINE CLAIR GLAMOROUS The VersaFine Clair pigment ink pad brings out the finest details. Once dry, stamped images are waterproof and will not smear. Images are light fast and fade resistant. Perfect for using with watercolors to color stamped images. The white edge of the ink pack is normal. 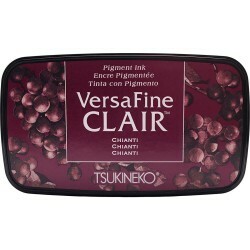 VERSAFINE CLAIR CHIANTI The VersaFine Clair pigment ink pad brings out the finest details. Once dry, stamped images are waterproof and will not smear. Images are light fast and fade resistant. Perfect for using with watercolors to color stamped images. The white edge of the ink pack is normal. 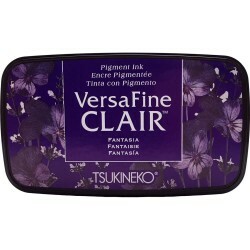 VERSAFINE CLAIR FANTASIA The VersaFine Clair pigment ink pad brings out the finest details. Once dry, stamped images are waterproof and will not smear. Images are light fast and fade resistant. Perfect for using with watercolors to color stamped images. The white edge of the ink pack is normal. 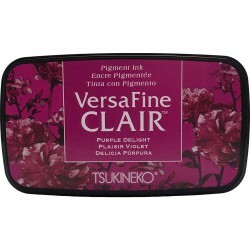 VERSAFINE CLAIR PURPLE DELIGHT The VersaFine Clair pigment ink pad brings out the finest details. Once dry, stamped images are waterproof and will not smear. Images are light fast and fade resistant. Perfect for using with watercolors to color stamped images. The white edge of the ink pack is normal. 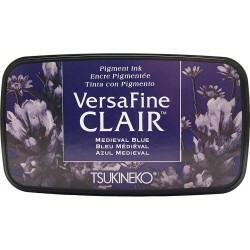 VERSAFINE CLAIR MEDIEVAL BLUE The VersaFine Clair pigment ink pad brings out the finest details. Once dry, stamped images are waterproof and will not smear. Images are light fast and fade resistant. Perfect for using with watercolors to color stamped images. The white edge of the ink pack is normal. 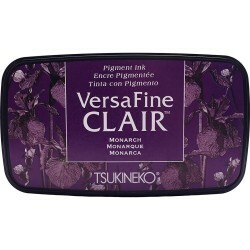 VERSAFINE CLAIR MONARCH The VersaFine Clair pigment ink pad brings out the finest details. Once dry, stamped images are waterproof and will not smear. Images are light fast and fade resistant. Perfect for using with watercolors to color stamped images. The white edge of the ink pack is normal. 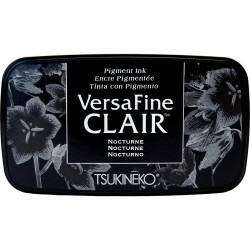 VERSAFINE CLAIR TWILIGHT The VersaFine Clair pigment ink pad brings out the finest details. Once dry, stamped images are waterproof and will not smear. Images are light fast and fade resistant. Perfect for using with watercolors to color stamped images. The white edge of the ink pack is normal. 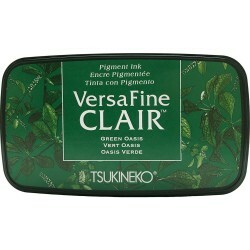 VERSAFINE CLAIR GREEN OASIS The VersaFine Clair pigment ink pad brings out the finest details. Once dry, stamped images are waterproof and will not smear. Images are light fast and fade resistant. Perfect for using with watercolors to color stamped images. The white edge of the ink pack is normal. 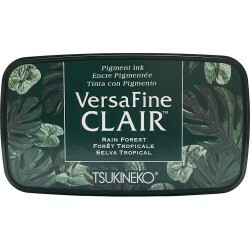 VERSAFINE CLAIR RAIN FOREST The VersaFine Clair pigment ink pad brings out the finest details. Once dry, stamped images are waterproof and will not smear. Images are light fast and fade resistant. Perfect for using with watercolors to color stamped images. The white edge of the ink pack is normal. 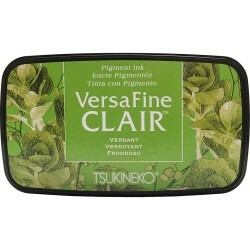 VERSAFINE CLAIR VERDANT The VersaFine Clair pigment ink pad brings out the finest details. Once dry, stamped images are waterproof and will not smear. Images are light fast and fade resistant. Perfect for using with watercolors to color stamped images. The white edge of the ink pack is normal. 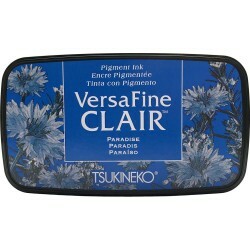 VERSAFINE CLAIR PARADISE The VersaFine Clair pigment ink pad brings out the finest details. Once dry, stamped images are waterproof and will not smear. Images are light fast and fade resistant. Perfect for using with watercolors to color stamped images. The white edge of the ink pack is normal. 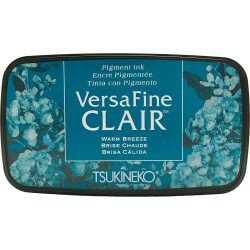 VERSAFINE CLAIR WARM BREEZE The VersaFine Clair pigment ink pad brings out the finest details. Once dry, stamped images are waterproof and will not smear. Images are light fast and fade resistant. Perfect for using with watercolors to color stamped images. The white edge of the ink pack is normal. 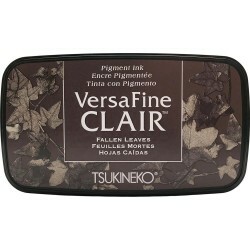 VERSAFINE CLAIR FALLEN LEAVES The VersaFine Clair pigment ink pad brings out the finest details. Once dry, stamped images are waterproof and will not smear. Images are light fast and fade resistant. Perfect for using with watercolors to color stamped images. The white edge of the ink pack is normal. 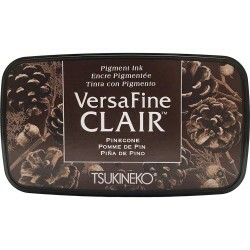 VERSAFINE CLAIR PINECONE The VersaFine Clair pigment ink pad brings out the finest details. Once dry, stamped images are waterproof and will not smear. Images are light fast and fade resistant. Perfect for using with watercolors to color stamped images. The white edge of the ink pack is normal. 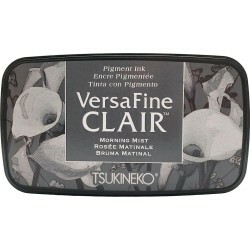 VERSAFINE CLAIR MORNING MIST The VersaFine Clair pigment ink pad brings out the finest details. Once dry, stamped images are waterproof and will not smear. Images are light fast and fade resistant. Perfect for using with watercolors to color stamped images. The white edge of the ink pack is normal. 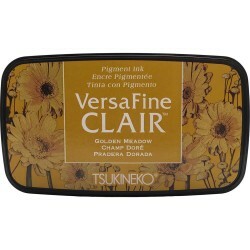 VERSAFINE CLAIR GOLDEN MEADOW The VersaFine Clair pigment ink pad brings out the finest details. Once dry, stamped images are waterproof and will not smear. Images are light fast and fade resistant. Perfect for using with watercolors to color stamped images. The white edge of the ink pack is normal. 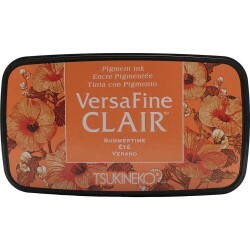 VERSAFINE CLAIR SUMMERTIME The VersaFine Clair pigment ink pad brings out the finest details. Once dry, stamped images are waterproof and will not smear. Images are light fast and fade resistant. Perfect for using with watercolors to color stamped images. The white edge of the ink pack is normal.